Since the World Summit of United Cities and Local Governments (UCLG) was held in 2016, in Bogotá, local and regional leaders have been making it clear that the global agenda must take account of the realities of each territory. Localizing the Sustainable Development Goals (SDGs) has become a priority for cities and territories. Localizing to build capacity and provide local and regional governments with measures tailored to each territory, each culture and each community. Local and regional governments have responsibilities related to each and every one of the 17 SDGs. Furthermore, the New Urban Agenda is directly linked to the daily work of city leaders and their administrations. 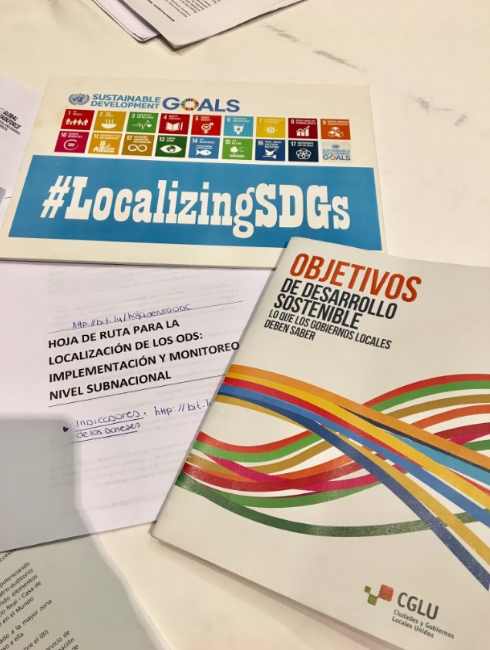 With the aim of supporting local and regional governments, and other relevant local actors, in localizing the SDGs, UCLG (together with UNDP and UN-HABITAT) has launched a global movement for localizing the SDGs, which extends beyond implementation. The challenge is to ensure that there are forums for the exchange of experiences and ideas, to support and to achieve genuine decentralized cooperation and real changes at the local and regional levels. It is an unprecedented opportunity to renew institutional models of governance because one of the elements required to localize the SDGs successfully is co-creating cities and territories, with the active participation of citizens and learning from the implementation of the experiences of a wide range of social actors. Through the inter-municipal partnership that this movement for localizing the SDGs is creating, new capacities and leadership models are being developed, together with various municipal associations and networks. Thanks to the initiatives and the involvement of our members in building bridges and dialogue on the SDGs, UCLG is holding many meetings which provide an opportunity to exchange tools and learning opportunities involving all levels of government, as well as civil society, the private sector and academia. For example, the different learning workshops on localizing the SDGs, which are being held on all continents. Each meeting enables a commitment, which began with a working session held in the framework of the Executive Bureau, in Madrid in April 2017, to flourish. It was the first time that representatives of local and regional governments, and associations, from Africa, Latin America, North America and the Middle East had shared their experiences and views on localizing the SDGs. From this moment on, there was a flurry of other meetings from May to June 2017, which took place in cities such as Barcelona (Spain), Brussels (Belgium) and Cordoba (Spain), organized together with organizations including UCLG-MEWA, M.I.L.E, UCLG-ASPAC, FAMSI, FLACMA, Mercociudades, Metropolis, and the CIB working group. and Ougadougou (Burkina Faso), where SDG 17 was set as a priority with work dynamics in which local cities drew on their own experiences. The month of July, and the months ahead, have started enthusiastically on the same path with several workshops organized under the umbrella of UCLG-MEWA and UCLG-ASPAC. Training sessions are also planned for Autumn 2017 led by institutions or networks, including FEMP, Barcelona Provincial Council, the CIB working group, M.I.L.E, UCCI, Guipúzcoa Provincial Council and the province of Santa Fe.